In 2002, the Reef Environmental Educational Foundation launched a collaborative effort with the Cayman Islands Department of Environment to observe the last remaining active Nassau grouper spawning aggregation in the Cayman Islands. Their objectives were to develop a protocol for monitoring Nassau grouper numbers and spawning activity at the site. Find lots of great information about Nassau grouper on this website, along with photos and videos of the Little Cayman spawning aggregation. A great video produced by students at NGM Major High School, Bahamas - here's a good idea for a project in your classroom! Here's a free, downloadable resource book that provides educators with scientific information and engaging, hands-on activities that encourage students to discover, cherish, and protect the sea and all of its treasures. Designed especially for educators in the Bahamas for grades three to six, it's full of good, age-adaptable ideas. 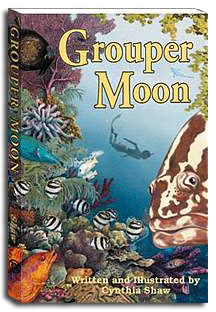 Here's a VIDEO of a poem about the Nassau Grouper recited by Miss Sophia Butler, a participant of BREEF 10, 2008 Marine Conservation Teacher Training Workshop. Looking for grouper pictures? Here’s a great place for seeing what’s available on the web.